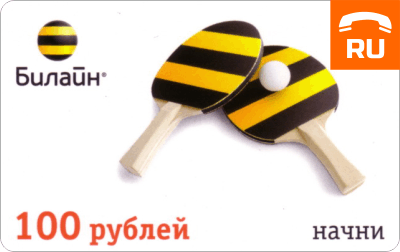 PIN-code is a single payment card Beeline par value of 100 rubles. to replenish the personal account in the network of mobile operator Beeline. To replenish your account payment card, type the command * 103 * [pin-card code] # or the number 0503. To refill the account of another party, dial * 104 * [pin-card code] * [phone number by which you deposit - 10 digits] # \u200b\u200bor the number 0504. The length of the pin-code card - 16 characters. After the teams wait for a message about the result of activation of the card. When finding in national roaming procedure refill the same as in the home network. To activate the payment card of "Beeline" in the territory, where there is a network of "Beeline", call 8 (800) 100-10-10. To pay can only be used the full amount of the card. Check the amount on the balance you can simply dial * 102 # or 0697 number. Support Center of mobile subscribers "Beeline" - 0611, around the clock, free of charge. Support Centre for users of other communications services "Beeline" - 8 (800) 700-800-0.